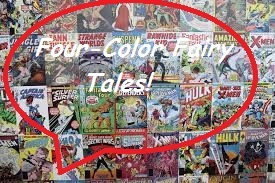 Four Color Fairy Tales: Lullaby. Hey, look what I found while I was cleaning! What is it? Why, I’ll have you know this is Lullaby by Hector Sevilla, Mike S. Miller and Ben Avery! It’s just the first fairy tale mash-up comic I ever read! I know for most people, the modern age of reinterpreted fairy tale comic books started with Bill Willingham’s Fables, but I didn’t read that until later. I wasn’t really into the whole Vertigo scene yet. At the time it all started I had not yet ventured into the world of comics that were written expressly for grown-ups and was still really into superhero comics and shonen manga (well, I still am into those but I’ve branched out since then). For someone who was more interested in splashy, action-oriented comics, Lullaby was a better bet than the slower, more nuanced Fables. Lullaby is the story of five characters who join together for a journey through a fantastical world. Their stated goal is to find their way to the land of Oz, but they all have different reasons for going. The cast consists of classic characters from fairy tale, legend and children’s literature, but they’re all different than the way you remember them. There’s Alice, who is the “Hand of the Queen of Hearts”, meaning she’s one of the Queen’s most trusted warriors. There’s the Pied Piper, who is apparently a second-generation Piper and may have been one of the many children taken by the original. There’s Little Red Riding Hood, who is now a little bit wolf and a little bit girl since her run-in with Big Bad. Pinocchio is in this too, as a creepy little wooden creature who’s had his humanity taken but finds himself connected to the great Tree of Life through the course of the story. Lastly, there’s Jim Hawkins, originally from Treasure Island. This version of Jim is a full-fledged pirate himself who carries a magic sword named Sharky that seems to feast on other magic. Everyone has their own reasons for being on this journey. Alice is looking for a way back to the world she was originally from before she found herself in Wonderland. The Piper is trying to help Red Riding Hood, but he also has a mysterious past in that he might be from the same world (the regular, non-magical world, actually) that Alice is from. Red is searching for her grandmother who got abducted from her home. Pinocchio is initially trying to get his humanity back, but shows some misgivings when he ends up connected to a bigger, more metaphysical world. Jim is mainly trying to help Pinocchio, but he ultimately wants to get a ship and become a pirate captain in his own right. The other thing that really sets this comic apart are the character designs. Simply stated, everyone looks like they were redesigned by a Japanese video game designer (technically, it was actually a Mexican comic book artist). I know these designs aren’t everyone’s cup of tea, but I dig them. It gets even crazier with some of the side characters. For example, the Three Little Pigs show up in the second volume and the pigs themselves seem to be made of their respective building materials. In addition to the pigs, there are a number of folk and literary guest stars both famous and obscure. Among them are the Billy Goats Gruff, D’Artagnan and Milady from The Three Musketeers, the Tortoise and the Hare, Baba Yaga and Makoma. I had too look Makoma up, but apparently he comes from this Rhodesian folk tale. Unfortunately, the book didn’t last long. Only two collected editions were made. However, if you do want to check it out, it looks like the publisher Abacus Comics posted a whole bunch of it for free on their website. You can check it out HERE. It may not be everyone’s cup of tea, but for some young comic reader out there it may be a good starting point like it was for me. Folk Tale Secret Stash: Iron Hans. You know, I try to start these posts out with something clever or some set-up that leads to me explaining why I like a story. But the truth can sometimes be that I like these stories for some of the simplest reasons. I mean, it seems like a given for a fairy tale, but sometimes I just like them for the fantastical concepts and imagery in them. For example, one of my favorite obscure Grimm tales is “Iron Hans” (sometimes called “Iron John”). No scene like this actually appears in the story. The story starts out with a forest that no one goes into anymore. Those who do don’t come out. Then one day a hunter from outside the kingdom is hunting in the forest and finds out that people are disappearing because they’re getting dragged into a pond by something from beneath the water. He goes and gets men with buckets. They drain the pond and find in the bottom a wild man covered in hair the color of rusted iron. The hunter chains up the wild man and brings him back to the king who puts him in a cage on display in the courtyard and gives the keys to his wife for safe keeping. It’s here that the wild man became known as Iron Hans. And Iron Hans would have stayed in that cage if it weren’t for the actions of a young prince. You see, this prince loses the ball he’s playing with when it goes into Iron Hans’s cage. He tries to get the ball back unsuccessfully a couple of times. The first two times, Iron Hans won’t give the ball back and says that the prince can only have it if he unlocks the cage and lets him out. Finally, the prince steals the keys from under his mother’s pillow, unlocks the door (pinching his finger in the process) and Iron Hans just strides right out. Knowing that he’ll be in trouble if his royal parents return and find Iron Hans gone, he tries to convince Iron Hans to go back into the cage. Instead, Iron Hans picks up the boy, throws him over his shoulder and carries him off into the forest. What follows is a journey for the prince, first as Iron Hans’s servant and then out in the world. I’m not going to give anything else away (in my earlier “Secret Stash” posts I had a tendency of giving away 90% of the plot). But I will give you a link to the story of “Iron Hans” right HERE. Overall though, I just like a lot of the fantasy ideas here. Just the idea of a “wild man” is great. Iron Hans’s wildness as well as his actions summon up that old idea of the “noble savage”. There’s also some serious archetypal mojo going both forward and backward in time. Along the same lines you’ve also got Enkidu from the Epic of Gilgamesh but following after “Iron Hans”, there’s also Mowgli from The Jungle Book and Edgar Rice Burroughs’s Tarzan. Heck, I could even make an argument for Wolverine from the X-Men. Also, while the story does describe Iron Hans as having long hair the color of rusty iron, it actually leaves a fair bit of wiggle room for the imagination. Personally, I tend to imagine Iron Hans as looking like kind of an odd mix of Tarzan, Bigfoot and Hagrid from the Harry Potter movies. There are some other good fantastical bits too. For example, there’s a spring that turns things golden and horses and armies that Iron Hans can seemingly produce out of thin air. But even the more mundane bits are interesting. The prince having to find work is interesting. There’s a princess (as usual in these stories) and the prince’s interactions with the princess are interesting. A war happens in the story (which actually is a mundane thing by fairy tale standards) and the description of the battle is interesting. So that’s really the basis for why I like the story. But just because I don’t read so much into this story doesn’t mean that nobody does. You see, back in the ‘90s a poet and storyteller named Robert Bly grew concerned for the mental and emotional well-being of men. To this extent, he wrote a book about masculinity, initiation and mentorship all based around an allegorical reading of the story of “Iron Hans”/”Iron John”. 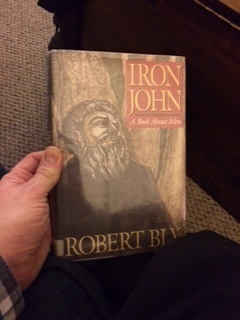 The book is simply titled Iron John. It was rather popular too. Popular enough that when NBC’s Grimm did an “Iron Hans” episode, they based it much more around Bly’s whole “masculine initiation” concept than they did around the actual story. Now let’s have some points for commitment to a blog post. I actually read Bly’s book in preparation for this post. 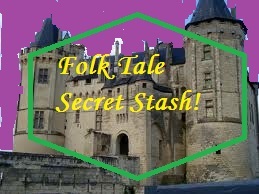 It’s the most research I’ve ever done for a Folk Tale Secret Stash. I find this book a little hard to explain. It’s not a bad book, really. You can tell from his constant drawing on mythology and folklore that he’s partial to writers like Bruno Bettelheim and Joseph Campbell. He also frequently illustrates his ideas through snippets of poetry. He has some interesting ideas. I don’t know if I agree with everything Bly writes. A lot of his examples seem anecdotal at best. Also, he seems to skip obvious bits of mythology that don’t really work with his allegory. For example, he talks about what it means for the prince to find work in the garden, but doesn’t mention the Garden of Eden from Judeo-Christian myth. Even if it didn’t fit, it would have been nice for him to acknowledge that it didn’t fit and say why. I’ve never been much for allegory, anyway. Before we can accept any kind of hidden meaning in fairy tales, we first have to accept them at the surface level. There are still so many stories that the wider public has not accepted even on that basic level. But I guess it just shows that everyone can see these stories and love them for different reasons. 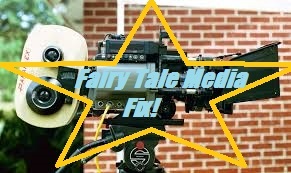 Fairy Tale Media Fix: Monarch's Factory. I’ve said before on other platforms that one of the things I’d like to figure out in my life is how to optimize the experience of oral storytelling for online video. I am myself a storyteller and a bit of a YouTube addict. So, figuring out how to combine the two became a subject of interest rather naturally. However, it might not be as easy a task as you might think. Oral storytelling is an odd artform. Ancient and yet odd. Through my own personal experiences, I’ve found that it’s an artform that becomes better through proximity. Sitting in an audience and watching a teller on stage is nice but I find it’s even better when sitting in a circle with friends to tell stories. So, imagine how much more distance is added when the teller is in a window on a computer screen. On top of that, oral storytelling probably maintains a reputation to this day because it’s viewed as a “stripped down” sort of media. The onus is entirely on the storyteller, their voice and their gestures. Meanwhile, video of any kind always exemplifies the visual. A hard nut to crack if ever there was one. However, if there was ever a YouTuber who comes really, really close, it’s probably Dael Kingsmill of the YouTube channel Monarch’s Factory. I’ve mentioned Dael before in a couple of different places. One was my “Awards Season” post and the other one was the “Fairy Tube” post. However, I thought it would be a good time to give her a post of her own. Previously I hadn’t done it because she largely focuses on myths and I don’t cover myths. But I figure, what the heck! I first discovered Dael’s work through the Geek and Sundry Vlogs channel (which I actually discovered before the actual Geek and Sundry channel). The Geek and Sundry Vlogs channel was a channel on which many people with geeky passions would post vlogs (video logs) about what they were interested in whether it was comic books, cosplay, retro gaming, books or even life tips like how to indulge in that stuff on a budget. Among the vloggers were folks like Amy Dallen, Kiri Callaghan, Scott Tumility and the 2 Broke Geeks. And one of the vloggers in the group was a young Australian lady named Dael Kingsmill with a show called Mythology 101. On Mythology 101, Dael would sometimes talk about the mythological influences on modern pop culture (gee, that sounds kind of like someone I know) but a lot of the time she would simply tell stories. She would bring her own quirky style to the ancient stories. Sometimes they would even be illustrated by one panel cartoons that wouldn’t tell the story for her but would at least provide the punchline to an unspoken joke. She has a real knack for exemplifying the absurd in ancient stories. Alas, the Geek and Sundry vlogs channel is no more. Yet, like many of the Geek and Sundry vloggers, she started supplying the same sort of content on her own channel. Not only that, she also expanded on it. In addition to telling myths, she started an occasional series of fairy tale retellings called “Faerie Daels”. Like this one she did of “Fitcher’s Bird”. She’s also dabbled in literary stories and stories from her family’s history. You can see her retelling of “The Nutcracker and the Mouse King” HERE and you can find out about how her family dealt with the Black Friday Bushfires of 1939 HERE. The secret to Dael’s success? Well, I told you about her style and cartoons and how she manages to play up the absurdity. But one of the other things I need to mention is just the fact that she manages to exemplify visuals without it taking away from her own telling of the story. One very notable thing is her background. Yes, the background. The thing she’s sitting in front of. One of the worst things that a vlogger can do (other than simply being bad at vlogging) is to sit in front of a boring background. A background should always be visually interesting without distracting from the vlogger/storyteller. A boring background makes a video look boring. I’ve seen far too many storytellers who were capable enough at speech and gestures but ruined the look of a video by sitting or standing in front of a plain white or black background (the only YouTuber I’ve ever seen make a plain white background work is The Nostalgia Critic, and that’s because he makes up for it with movie clips and sketches that keep things interesting). And if you’re a storyteller who’s bothered by the idea of having to play up the visual in a storytelling video for whatever reason, well, have you considered maybe podcasting instead? There’s more than just storytelling videos on Monarch’s Factory. There are also gaming videos and other vlogs. There’s also TED. Not TED talks, that’s another channel. TED here means Too easily Distracted, in which Dael elaborates on the random thoughts that run through her mind on a regular basis. But I think it will always be the Mythology videos (and to a lesser extent Faerie Daels) that keep viewers hooked. She may not have completely optimized the storytelling experience for video, but she’s one of the closest I’ve seen. She’s certainly better than my own early experiments with it (HERE is a sample. I warn you, it’s not pretty). Just recently, Dael posted up a video entitled “Fate of the Factory” in which she relates that she not only finally earned her university degree (congratulations!) but has plans to change up the format of her channel going forward. So, I don’t know what her videos are going to be like going forward but I wish her luck in her continuing efforts. But I thought this would be the perfect time to put up a post about her channel as she enters this exciting new phase in her YouTube career. So, if you haven’t seen any of Dael’s videos, check out the ones she has from the past and be prepared for what she’s got coming in the future. Fairy Tale Media Fix: Thumbelina. I’ve mentioned before that fairy tales aren’t necessarily the easiest stories to adapt into other media. And it’s true of both folk tales and literary fairy tales. But I thought we should take a look at an example. Let’s look at Don Bluth’s 1994 animated film Thumbelina. 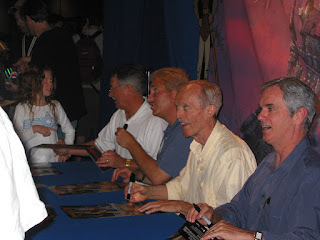 Some quick background on Don Bluth and his production company. Don Bluth was an animator at Disney. He started in 1955 and worked on a number of films including Sleeping Beauty and Pete’s Dragon. Bluth left the company for a while but returned later. He didn’t quite like what he saw when he came back, though. After Walt Disney had died, Disney Feature Animation had settled into a slump in which they made a number of movies but many of them were without the artistry or risk-taking that previous projects did. So, Bluth set out to start his own studio and took about nine of Disney’s animators with him. Or, so I’m told. In all honesty, that may have been more showbiz legend than anything else. Anyway, regardless of how much truth is in that, Don Bluth became a big competitor against Disney for a while. Now, Disney always has competitors. Their big one now is Dreamworks. In the earliest days it was Fleischer Studios followed by Warner Brothers. But in the mid-to-late ‘80s, it was Don Bluth’s company. The thing about Disney is that once they settle into the right groove, they become hard to compete with. Disney was on a real streak after 1989’s The Little Mermaid. Thumbelina came out in 1994, the same year as The Lion King. By this point, all the folks trying to compete with Disney just said “Okay, you win” and started to copy their formula. Don Bluth had made some great animated films like The Secret of NIMH, An American Tail and The Land Before Time, all of which emphasized being different from their competitor. But Thumbelina is pretty much just a Disney animated musical as made by Don Bluth. They even hired Jodi Benson, the actress who played Ariel in The Little Mermaid to play Thumbelina. The much more notable thing is that, other than moving around a few bits and making a few parts more splashy for the big screen, the movie is reasonably faithful to the story by Hans Christian Andersen. It hits all the same story beats. 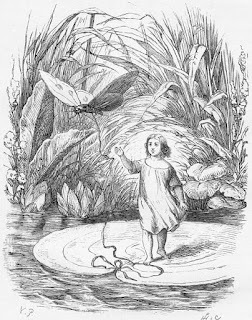 For those who don’t know, “Thumbelina” (called “Inchelina” in my HCA collection) is the story of a tiny girl born from a flower who gets kidnapped by a toad one day and ends up out in the world. Thumbelina basically ends up moving from one situation to the next, usually in a situation in which some random animal wants to marry her. Finally she ends up meeting the fairy prince and decides to actually marry him and that’s where happily ever after happens. That’s about it. I’ll leave a link HERE to the actual story so you can get the full effect but I think I summed it up rather well. The movie basically follows this basic plot. Some stuff is expanded upon to give more space for musical numbers and such. The Toad and his mother are now performers. The Beetle works at a nightclub. Possibly the biggest changes are that Thumbelina’s meetings with both the Fairy Prince (named Cornelius here) and the bird (now named Jacquimo) are moved up so they happen earlier in the story. Having Thumbelina meet the bird earlier doesn’t do much for the story. Jacquimo’s main purpose in the story seems to be giving Thumbelina pep talks and going on and on about how love can make people do the impossible (something that I suppose is meant to be the movie’s theme but never really strikes home). Having Thumbelina meet the prince in the first act gives the story a little bit more to work with as it turns what were a string of random encounters into events that are keeping her and the prince apart. It also allows them to add in a big action set piece at the end when she almost marries the Mole. While that does add more of a through-line to the movie as well as a more dramatic climax, it doesn’t do much to change the fact that it’s a movie that has about three largely independent antagonists and a rushed love story (the big love duet now happens in the first act). The end result is a movie that is mostly true to the fairy tale but kind of flows in a weird way compared to most Hollywood family films. And that is probably most indicative of the problem with relying on Hollywood to popularize fairy tales. Hollywood films are very reliant on a codified structure while most fairy tale traditions date from a time before that structure existed. Some of them seem like strings of random encounters. Some seem like two stories stuck together. Others have antagonists that only appear at one part of the story. And yet, for the US, Hollywood’s movies and TV shows are pretty much the only folks to have the kind of reach to popularize anything. The movie has other issues, too. Some of the character designs seem really weird. The toads are depicted as having hair and, in the case of Mrs. Toad, breasts (probably because she’s being voiced by Charo, of all people). It’s really taking anthropomorphizing a bit too far. There are songs in this movie, but none of them are particularly great. They’re composed and written by Barry Manilow, and even though I’m not a fan of his I can still say that they’re not quite up to “Copacabana” level. Probably the worst one is “Marry the Mole”. But possibly the worst bit is that we really don’t get much out of the heroine herself. She mainly seems concerned with marrying Cornelius (who she just met) and being the only person her size. While she didn’t have much personality in the original Andersen story, this was the filmmakers’ chance to flesh her out and they didn’t. It’s especially troubling considering how their competition had been adding more personality to their female leads. Thumbelina isn’t curious like Ariel or feisty like Jasmine or bookish like Belle. She’s just pleasant like another Snow White, which I should remind you is from 1937. The movie is watchable. It’s not great or even good, but it’s watchable. I’ve certainly seen far worse animated movies (like The Swan Princess for example). I admire that it exists and that work went into it, especially since the “tiny people” archetype in fairy tales doesn’t seem to be all that popular anymore. But I certainly wouldn’t go out of my way to watch it.